This novel CED device promises larger volume of drug distribution than with prior CED devices. Early human testing in glioma patients supports that hope, and use in other CNS conditions is being explored. Despite exciting progress against many forms of cancer, brain tumors — particularly gliomas — remain one of the deadliest malignancies. Their lethality stems largely from the fact that glioma cells are highly infiltrative in the brain and resistant to DNA-damaging therapies such as radiation therapy and cytotoxic chemotherapy. These intrinsic cell properties underlie the failure of both surgery and radiation, even in combination, to prove curative. Gliomas are also resistant to most targeted anticancer therapies, which lack access to the cancer cells themselves because the blood-brain barrier (BBB) prevents their entry to the brain. Multiple strategies have been tried to at least temporarily open the BBB to allow passage of anticancer therapeutics, but these efforts have not produced clinical benefit for glioma patients. Moreover, attempts to re-engineer therapeutics to enter the brain via known endothelial transporters have yet to see clinical success. Another approach for improving delivery of anticancer agents to the brain is convection-enhanced delivery (CED), in which therapeutic agents are introduced directly into brain parenchyma via surgically implanted catheters connected to low-rate infusion pumps. While this technique has been in use for nearly two decades, it remains investigational, as no therapeutics have been approved by the FDA for infusion directly into brain tissue. Over the past decades, several large clinical trials identified a need for new CED-specific technology that would more reliably produce successful delivery to the brain. Now a partnership between Cleveland Clinic and the Cleveland-based multinational manufacturer Parker Hannifin Corp. has produced one of the first CED-specific catheter technologies to enter clinical trials — namely, the Cleveland Multiport Catheter™ (CMC). The new technology traces its origins to 2009, when Cleveland Clinic’s technology commercialization arm, Cleveland Clinic Innovations, enlisted this article’s senior author (Dr. Michael Vogelbaum) to lead a CED catheter development team including biomedical engineers, a patent attorney and a business development officer. The aim was to build on Dr. Vogelbaum’s experience with CED in clinical trials and his proposals for multiple new catheter designs. After extensive work to set design parameters, brainstorm device concepts and vet the concepts according to patentability and feasibility criteria, the team arrived at a design they called the “cat’s paw” concept. It consisted of two microcatheters deployed from the wall of a central catheter implanted in the brain via conventional stereotactic neurosurgical techniques. Initial prototypes were created by Cleveland Clinic’s Department of Biomedical Engineering, and functional testing was performed in Dr. Vogelbaum’s laboratory using in vitro, ex vivo and in vivo models. Following successful testing, the device concept was selected for further development by a joint development group formed with Parker Hannifin to commercialize new technologies from Cleveland Clinic Innovations. Dr. Vogelbaum’s development team worked with Parker Hannifin engineers to create a clinical version of the new CED device (Figure 1), which now had four microcatheters and was named the Cleveland Multiport Catheter. Figure 1. The Cleveland Multiport Catheter shown in undeployed (left) and deployed (right) views. Extensive preclinical testing was followed by an IND approval from the FDA to conduct a first-in-human clinical study of delivery of the chemotherapeutic agent topotecan via the CMC in patients with recurrent high-grade gliomas. Cleveland Clinic Innovations formed a spinoff company, Infuseon Therapeutics Inc., to lead clinical development of the CMC. The first-in-human study of the CMC is being conducted at Cleveland Clinic in patients with recurrent high-grade gliomas. The first patient was treated in December 2014, with five patients having completed treatment under the study protocol to date. These procedures have involved placement of two CMC catheters into the brain using conventional stereotactic neurosurgical techniques. In all five cases, one catheter was placed into solid tumor and the other into tumor-infiltrated brain tissue surrounding the tumor mass. Topotecan cannot normally enter the brain but has shown activity against glioma cells; it was infused via the catheters, along with a gadolinium tracer visible on MRI, for a total of 96 hours. MRI was performed intermittently and showed that the infusions produced widespread distribution of the drug and tracer into the tumor-infiltrated brain in all five patients (Figure 2). Figure 2. Axial (left), sagittal (middle) and coronal (right) MRIs showing the distribution of infused topotecan and gadolinium in tumor-infiltrated brain 24 hours after the start of infusion via the Cleveland Multiport Catheter. No intravenous contrast was given; the white areas represent the distribution of the infused gadolinium. While experience with the CMC is still developing, both the extent of brain tissue covered and the reliability of the technique in these five patients are largely unparalleled by past experience with CED. Two other CED devices that recently entered the U.S. market each have a single infusion port and can be used only while in an OR equipped with intraoperative MRI capabilities. Consequently, these other devices can be used only for several hours, which limits the amount of therapeutic agent that can be infused. The CMC, in contrast, can be placed in any neurosurgical OR and left in place for several days after surgery, which likely permits a larger volume of drug distribution within the tumor and tumor-infiltrated brain. Additional clinical evaluation of the CMC in patients with recurrent high-grade glioma is continuing. As the primary goal is to determine how best to maximize the CMC’s delivery of therapeutics in the brain, these studies aim to maximize the volume of distribution (as assessed by MRI of the co-infused tracer) via manipulations of infusion rate and duration. Once use of the CMC has been optimized, Infuseon Therapeutics will reach out to the biotechnology and pharmaceutical industry to partner in the clinical development of therapeutics that require direct brain delivery. The Infuseon team expects that this initial optimization of the use of the CMC will require a total of 10 to 20 patients. Treatment of brain tumors is only a starting point on a broad spectrum of potential uses for this platform technology. The CMC has been designed to be capable of delivering any number of drugs, biologic therapies and cellular therapies to the brain, and Infuseon is pursuing partnerships with investigators and companies that are developing therapeutics for multiple neurologic conditions (including neurodegenerative diseases, stroke and epilepsy) in addition to brain tumors. Dr. Vogelbaum is Associate Director of the Rose Ella Burkhardt Brain Tumor and Neuro-Oncology Center. He is also the Robert and Kathryn Lamborn Chair for Neuro-Oncology, Director of the Center for Translational Therapeutics and Professor of Surgery (Neurosurgery) at Cleveland Clinic Lerner College of Medicine. 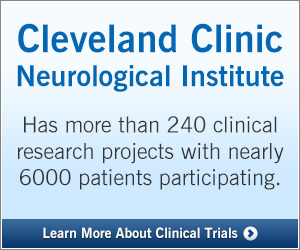 Dr. Habboub (habboug@ccf.org) is a resident in Cleveland Clinic’s Department of Neurosurgery. Disclosure: Dr. Vogelbaum is an inventor and patent holder of the Cleveland Multiport Catheter (CMC) as well as founder and Chief Medical Officer of Infuseon Therapeutics Inc. He holds equity and royalty interests in these entities. His participation in the CMC’s clinical development is covered by a Cleveland Clinic-approved conflict management plan.